Ranitidine also treat other condition in which the acid in the stomach flows back up to the esophagus causing heartburn. It also heals acid –related damage to the lining of the esophagus or erosive esophagitis. 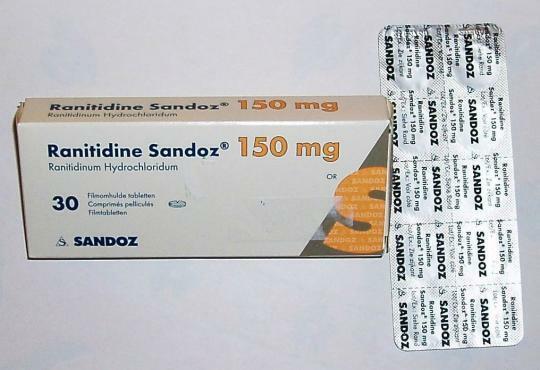 Ranitidine is an H-2 (histamine -2) blocker. It works by blocking the production of acid produce by the acid-producing cell in the stomach. Histamine is a naturally occurring chemical in the body. It stimulates the acid-producing cells to produce acid. Ranitidine inhibits the actions of histamine thus reducing the production of the acid that can cause damages to the esophagus, stomach and duodenum. Ranitidine is available as a prescription drug and as a brand name drug. The generic drug cost a lot cheaper than the brand names. It may be used as a part of a combination therapy. Take 1 tablet as needed with a glass of water to treat heartburn and indigestion. Take 1 tablet of this medication 30-60 minutes before a meal to prevent heartburn and indigestion. The recommended dose is 2 tablets of 150mg or 1 tablet of 300mg. The maintenance dose is 150mg a day. Take the drug after the evening meal or at bedtime. Use as much as 6 g of this medication in a day. To help relieve the pain, your doctor may recommend an antacid. DO not use this medication more than what is prescribed. If you are self-medicating, do not take it longer than 2 weeks. Do not take more than 2 tablets within 24 hours unless directed by your physician. If your symptoms do not improve for 14 days in a row, stop taking this medication. Seek medical attention as soon as possible in case of serious side effects. Ranitidine is not suitable for children 12 years of age and below unless directed by a physician. Pregnant can use this medication only if clearly needed. Patients with kidney and liver problem must use this medication with care. Ranitidine can cause severe allergic reaction. Do not take this drug if you are allergic to it.